Need some cycling speed for your upcoming race? Race Wheels provide a great opportunity to gain some speed fast. Let us help you find the right wheels for your race. How do you determine the right race wheel for you? In general, carbon race wheels provide more comfort as they absorb the vibration of the road so that you are able to hold your power longer and have a better run. The deeper the rim of the wheel, the more aerodynamic you are. With that said, you have to take into consideration windy conditions, especially cross winds, because the deeper the rim of the wheel, the more wind affects control of the bike. Cross winds create instability for the bike so you have to engage your core to stabilize the bike and need better bike handling skills. Here are our top three recommended wheel combinations. *Remember that these are general rules so if you fall under multiple wheel sets or aren't sure what is right for you, stop by a Playtri store near you, hit us up on social media or email us at info@playtri.com. We can help you decide the right wheel set for you based on your cycling skills, your goals and your race course! Buy the Right Set of Race Wheels for you at Playtri today! When it comes to the best nutrition advice, there’s a ton of info out there — some that contradict each other. It can be hard to decipher what is actually good advice and what’s something to read and put aside. From fad diets to the new trend, misinformation can be found everywhere. I always tell my athletes to be wary of “secrets to success” and new products being developed that guarantee to work better than their counterparts. The key to all of the nonsense? Realize there is no magic potion or one set of rules that is one-size-fits-all. Here’s a summary of the best advice I’ve been given over the years as a professional triathlete for training/racing and overall day-to-day nutrition. These haven’t changed no matter what new hot product is on the market or what fad diet is trending. Keep it Simple. In all areas, keep what you eat as simple as possible. Stick to the same products for training as you would racing, snack on easy items like a healthy bar, apple with almonds. There’s no need to reinvent the wheel every time you eat. Make a list of good snacks, meals to eat, and items for training and racing that you can use daily. For meals, rotate them weekly, get a variety of in by augmenting with different lean meats and vegetables. Keep a food log – occasionally. Keeping track of your food intake (what you eat, how much and when) can help you see your food habits (good and bad). By looking back on these days you can see what needs to change to help you fuel and recover better. There’s no need to do this everyday – once every month or two is good plan. Enjoy what you eat! Yes, food is fuel but that doesn’t mean it has to be bland, be disgusting and/or boring. There are plenty of healthy snacks/bars out there for on-the-go snacks/meals that are not only highly nutritious but delicious. Don’t be afraid to add spices/herbs to your meals and opt for foods you like. If those foods are unhealthy, find alternatives that do the trick. For example. I love mac and cheese. Instead of this, I make a tasty fried cauliflower rice with a small amount of goat cheese, fresh herbs and spice. Have a replenish meal every week. This is where you can enjoy the sought-after meals you find alternatives for all week. Sushi is my top pick. We don’t concern ourselves with amount and just enjoy the meal and time together. It helps us focus on the week and also enjoy a good meal together. Eat carbs. There are many fad diets and advice recommending no carbohydrates for training. The body requires them and using your race nutrition during training is key to a successful race day outcome. Using carbohydrates during the right meal windows (before and after training; pre-day large meal for a race) will help you not only feel better, but race with the energy required to perform at your best. Keep it real. A good rule of thumb is four fruits and four veggies a day. This is easily incorporated into a daily diet. Make meals with a good size of vegetables and snacks to a piece of fruit with nuts or a healthy snack bar made of similar ingredients. Plan Ahead. How hard is it to pack an apple and a bag of almonds? It’s not. When you’re on-the-go, have back-to-back workouts, a heavy work schedule, pack a lunch and snacks the night before — this should be as much of a priority as your workout itself. Bring training nutrition, recovery fuel and everything you think you’d need in a day and then some. It’s easy to have extra nutritious items stored in your gym bag and/or car. Eggs. One of the most versatile foods out there. You can eat them by themselves, with vegetables, bake with them, and mix them with just about anything. They are highly nutritious and a great source of protein and fat. Train like you race. Use race nutrition while training. Don’t wait until race day! Be consistent and practice this to ensure your gut can absorb what’s required. Stick to the same fuels. Liquid fuels work the best for most people. Eat enough Even when trying to lose weight, many individuals skip out on caloric intake when it’s needed the most (during training and recovery). Tracking calories can be helpful for learning what you eat for a few days. Seeing and talking with a sports dietician is also helpful for those trying to maximize their fitness and learn how much they should be eating for their weight loss goals and racing. "You need to 'WIN' the transitions this weekend!" True story, pushing the 'free speed' in transitions can be the difference in landing your next PR or podium finish! Why are transitions considered 'free speed'- maybe the correct term would be finding 'easier speed' than what is required in the swim, bike, or run legs of triathlon. 1- Keep your space TIDY! You are not moving into nor taking a nap in transition (better yet, you shouldn't be if you are planning on nailing some new goals). So, minimize the junk. 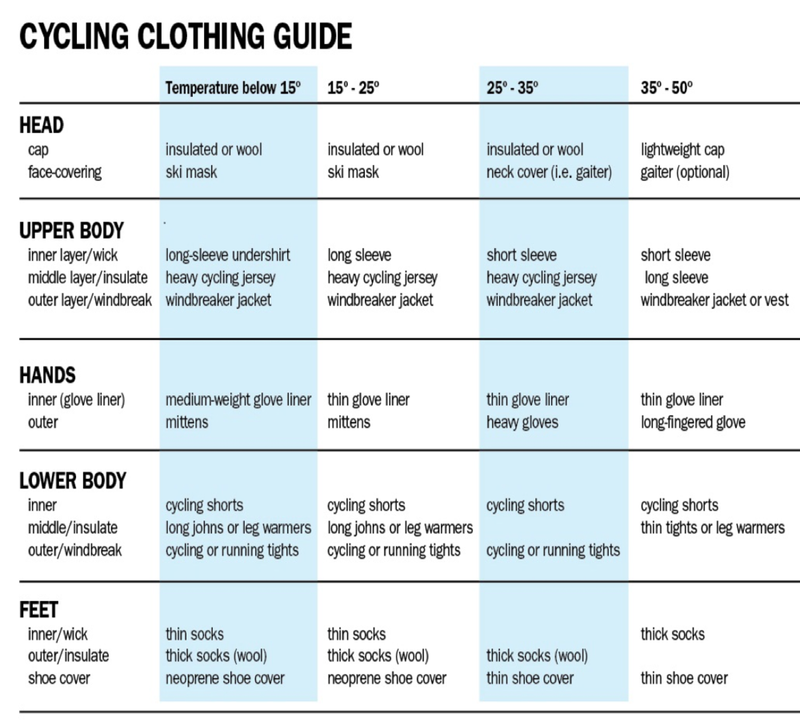 You should have a small hand towel- at the front of the mat: bike shoes (if not starting with them on your bike), helmet on top of the shoes with sunglasses and gloves (if you are wearing them inside the upside down helmet. Right behind the bike gear, place your running shoes, rolled socks to the toe inside the shoes (if wearing them, all you have to do is put your toe in and roll those guys up quickly), then race belt and sunglasses on top of all that. Notice everything is uniform and easy to grab and go- if you need to put nutrition in there- place them INSIDE the shoes so you do not forget to take with you. 2- Learn to start and/or get off with your toes on bike. This is a trick- YOU MUST PRACTICE AND NOT SIMPLY 'YOUTUBE' THE HOW-TO ON THIS ONE! 1st master getting OFF your bike (headed into T2) with their shoes attached. This may look easy, but your legs are going to feel like Jell-O. You have to focus on controlling the bike and navigating the dismount line and other athletes. Even slipping the shoes off before the dismount line and simply stepping off the bike in order to not wobble to your bike rack (due to the bike shoes being uneven and even slick)- you will automatically increase your speed. The 2nd aspect of this shoes on the bike concept that I emphasize is starting with your shoes on the bike, possibly using a rubber band to keep the shoes in place, and then stepping onto the shoes at the mount line (step NOT jump yet) in order to work the feet in ONLY AFTER you have gotten up to speed and have the momentum to carry you through as you work the feet in. The 3rd step I take with athletes is to practice incorporating the 'flying squirrel mount'/ flying mount and smooth, speedy, gliding dismounts. Lastly, I worry about the speed in which the athlete runs with the bike. This is last on my priority list because it won't matter how fast you run or come in off the bike- if you can't control the technique it is likely you will actually end up slowing yourself down, getting in the way of another athlete, or falling at the line. Speed will come- see #3 below, work the technique first of each detail. 3- PRACTICE sprinting / fast running a.) with your bike in and out of 'transitions' b.) as if you are leaving T2. You should be moving fast- your heart rate is most likely going to feel like it is going to pump out of your chest. GOOD! You are doing it right. But you need to get used to that feeling + you need to be able to focus and work transitions effectively. You don't want your speed to get in the way of executing the details. Upon leaving T2, I ask clients to push through to the line and then worry about settling into pace. Why, otherwise I have some that get a little 'lazy' + this allows the athlete to get their run legs under them with the increased cadence and effort= then we worry about falling into the race strategy / pace of the run. So here's to finding some 'easier speed' faster transition times = getting you to the finish line, PR, and podium FASTER! See you at the races and Happy Training. Working on swimming technique can often feel like you’re simultaneously patting your head and rubbing your belly. Using the snorkel allows you to eliminate one of the trickiest parts of the stroke which is breathing. You then have the ability to focus on correcting other areas of your stroke. The Michael Phelps Focus Swim Snorkel is my personal favorite because it securely stays in place and the wider mouthpiece allows your mouth to comfortably relax while maintaining a secure seal to the water. Most triathletes work against themselves by either not kicking or by using a kick that’s too big. Here’s the problem…a lack of kicking results in the sinking leg syndrome and a big kick creates drag making you less energy efficient. The goal is to have a compact kick that helps you maintain a level body position while contributing to your forward momentum. Efficiency and power are the name of the game in swimming. Many swimmers exert effort that does not translate to speed. Having an inefficient underwater pull is a large contributing factor to this loss of speed and energy. Paddles are a great way to improve power and efficiency in the water. However, it is very important for you to have proper stroke technique before adding paddles to your workouts. Adding paddles to improper form can lead to injury. 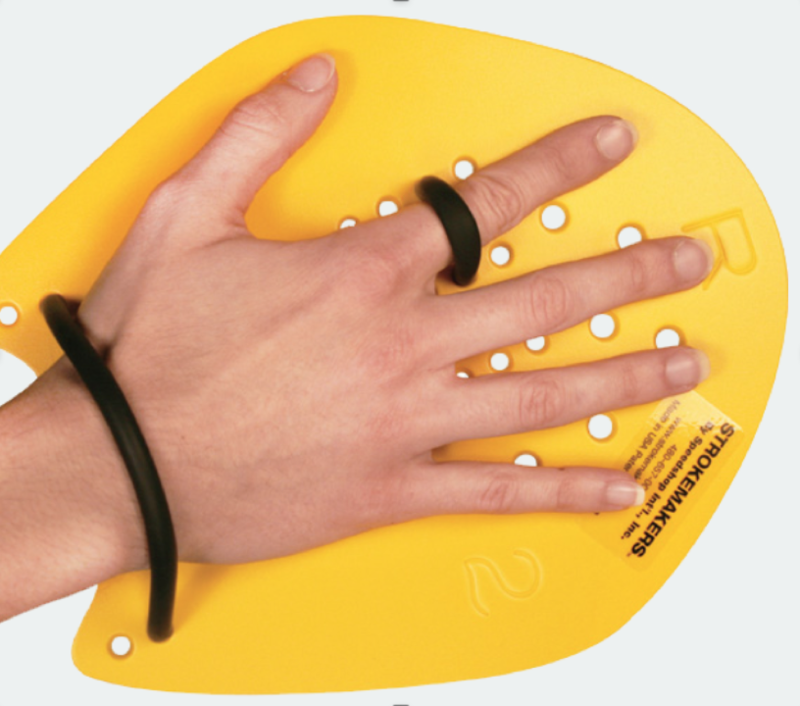 The Stroke Maker Hand Paddles come in various sizes so you can select the best fit. They are also designed with several holes throughout the paddle to allow for an appropriate amount of resistance. Find these recommended products in store or online at Playtri.com! Thinking of entering your first triathlon or joining a team? Here are some thoughts to consider. Triathlon may not be a true 'team sport', but it is a community sport. We might be out racing individual, but the struggle and fight we all experience throughout the race, and oftentimes in training, is shared. If you've participated in or even viewed any race, it's easy to see the camaraderie among the competitors and spectators alike. The energy is addicting! When you combine all of that with the power of a team, that energy becomes electric. The camaraderie helps get to to the workout and often gives a newbie the confidence that they can and should keep proceeding to that finish line. There is nothing like recognizing your teammates in the wee hours setting up in transition or out on the course giving or receiving a cheer “Go Team” when you (or others) need it most. And of course, having teammates at the finish line is an extraordinary experience. It’s great to celebrate or commiserate the trials of your triathlon journey with someone that experienced the course firsthand. No qualifying times to join and no mandatory anything! Just a positive attitude and willingness to empower other women. Opportunity for race homestays. Group that allows geographically dispersed women to meet and bond about their passion. Monthly challenges and tons of product/giveaways - $35K in gear! Whether you choose to join a team or go it alone, we’ll see you out there! You got this!! Comfort trumps. You’ll want to be sure you’re getting a bike you feel comfortable riding in both a technical standpoint, and riding. Comfort comes from a good bike fit and size of bike, and a good shop will recommend bikes suited to your frame and interests. Consulting with knowledgeable, trusted bike fitters helps to ensure best results with bike fit. A discussion of the style of riding and where the rider wants to improve– whether speed, handling, turning, etc. – is key. Being able to communicate with the bike fitter in person or virtually allows for the best outcome to learn about the rider and what they are trying to achieve. And always test-ride before you buy! There are many brands to consider for a triathlon bike and a big part of this decision is budget, so take a look at starting price points for bikes is a good way to determine what to expect you’re your budget. Aluminum bike frames are less expensive than carbon frames, which is a major consideration for pricing. You can expect to spend $1500+ on a triathlon bike, or $500+ on an aluminum road bike. Different brands will provide a different fit and feel, so make sure you give yourself plenty of options when looking for that perfect bike! When I looked at bikes, I made sure to consult with my trusted fitter to ensure the Quintana Roo PRSix would fit me and help me achieve my goals. Playtri recommends testing several brands based on the fit assessment if shopping in store, or narrowing down choices with a bike specialist if shopping remotely. Larger shops and brands should provide a satisfaction guarantee program allowing exchanges if the athlete is not completely satisfied. Personally, I have been a Shimano athlete for a decade, so Shimano is #1 in book for cycling components – I particularly like that they have electronic components at fair prices that make my bike ride smooth and fast! However, there are plenty of high quality bike components and brands to choose from. If you don’t know the difference in components, your local shop can help you understand differences in pricing and performance. I always recommend athletes start by looking at a brand’s “middle-of-the-road” component set. I myself use Di2 Ultegra electronic shifting, which has helped me become a stronger and more efficient cyclist. Electronic shifting has become more affordable, and is very versatile. You will want to look at your gearing as well. For most riders, I recommend an 11-28 rear cassette and 53/39 for the front cassette, which usually allows enough variety in gearing for almost any type of riding. However, a good bike fitter and shop will make sure you figure out the right components and gearing for your skill set and cycling goals. When you walk into the bike shop, you want to feel comfortable right away. If you don’t, you have gone to the wrong shop! You should be able to get measured, talk to them about the type of riding you plan to do, and get answers to your questions. A good shop will recommend bikes suited to your frame and interests, and give you the opportunity to test-ride those bikes (highly recommended). You should be able to reach out to them, and get answers back within 24 hours whether you call, email or message the store. And, most importantly, you should feel like they want to help you find the right bike for you. At Playtri, they will work with all athletes to achieve each athlete’s goals. Need help or have inquiries about how you can be more comfortable or ride faster? 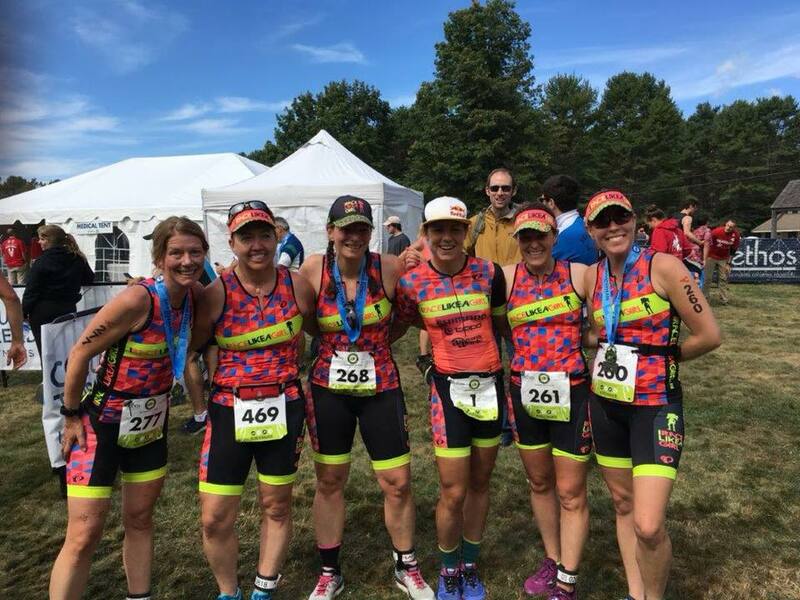 Playtri has been outfitting triathletes and specifically women in triathlon for over 18 years with exceptional service, expansive selection and critical knowledge enable athletes from all backgrounds to invest in their health and well-being. Start here by finding a Playtri store near you: Playtri.com/locations or emailing info@playtri.com so their bike specialists can work on finding the perfect bike for you and your goals! Swim drills! Who needs them? Have you ever finished a swim and thought, “How am I going to complete two more legs of this race? I’m exhausted!” Or perhaps you have said, “How did that person beat me out of the water? I am in WAY better shape than they are!” If this sounds familiar, I encourage you to consider adding swim drills to your swim routines as a way to conserve energy expenditure while increasing your speed. Let’s address three common myths encountered during the triathlete training process. Okay, Speed Racer! I respect your goal of wanting to lower your swim time. However, I challenge you to answer a question. Do you want to feel fast or do you want to be fast? There is a huge difference between these two things. Unfortunately, moving your arms and legs faster doesn’t always equal faster swim times. More times than not, it just means trading a lot of energy for nothing of value. Many swimmers avoid drills like the plague because they currently have to move their arms and legs super fast just to stay on top of the water. The beautiful thing about intentionally slowing down your stroke is that this process reveals stroke weaknesses that need to be corrected. Just like babies must crawl before they walk, swimmers must lay a foundation for their stroke by going slowly before they can go fast. If the underlying issues with your stroke are not corrected, you will always exert more energy than needed and your speed will ultimately plateau. Take time to review and implement the fundamental drills associated with this article. If you’re a DIY (Do It Yourself) triathlete, practice the drills to improve your stroke technique. However, if you want help diagnosing stroke challenges or would like to accelerate your progress, contact your local Playtri to schedule a session with a swim specialist. We are here to help you achieve your epic goals! 1.) How do I get faster? 2.) What’s the fastest way to get there? This article will focus on one of the most common issues preventing triathletes from reaching their potential in the swim. The goal of the swim portion of a triathlon is to be as efficient as possible to conserve energy for the Bike and Run without sacrificing speed. After years of coaching swimmers, I’ve identified a common issue I refer to as the “Sinking Leg Syndrome”. This happens when a swimmer is dragging their legs through the water instead of balancing on top. This is a big problem with triathletes due to the epic leg muscles that are developed through bike and run training. Here are the cold hard facts…fat floats and muscle sinks. This means that learning to effectively counterbalance your body in the water is essential to having an energy efficient, fast swim. When learning to counterbalance your body, I encourage you to think back to your playground days and focus on the mechanics of how the see saw worked. If one side was up, the other side was down. It’s a very similar concept in the water. If your legs are sinking, you have to counter that by keeping your eyes looking down, head in a neutral position and upper body pressing slightly forward. The best way to practice proper body position is by using a snorkel. In my opinion, the Michael Phelps Focus Swim Snorkel is the most comfortable and effective snorkel on the market. Some of you may be thinking, “I’ll just dig out my old scuba snorkel”. 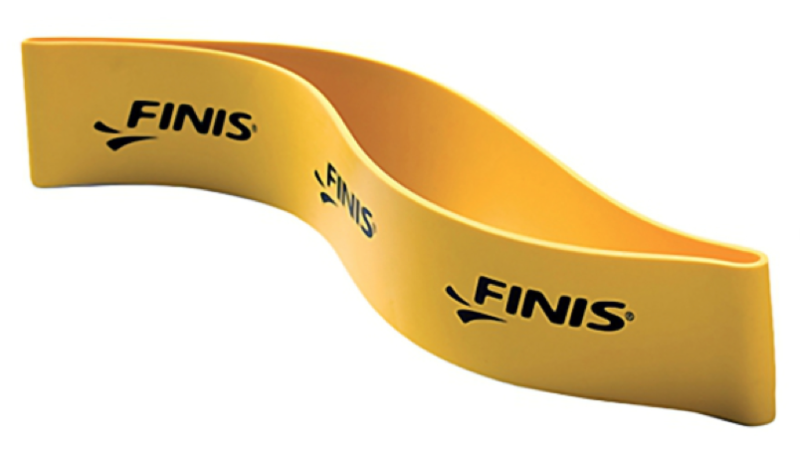 As someone who really wants you to have a positive experience training with a snorkel, I strongly encourage you to invest in a swim snorkel that is specifically designed to stay in place during your swim training. The only other thing you may need is a nose plug. Some swimmers are able to use a snorkel without experiencing a wonderful sinus cleanse (aka-snorting water up your nose) but most newbies to the snorkel world will need to start with a nose plug until they’re comfortable. Find someone to help you. Get a coach, join a triathlon group, find a training buddy. 3 swims, 3 bikes, 3 runs a week - one being a brick. Strength train: not just in the gym but in the three disciples. Use tools like an elastic tubing on your ankles while you swim with paddles, low gear work on the bike and running uphill. STOP fearing your finish time. Treadmill running - to build a faster cadence. Get a good bike fit - Optimizing your bike fit not only improves your performance, but also increases comfort while decreasing your odds of injury. 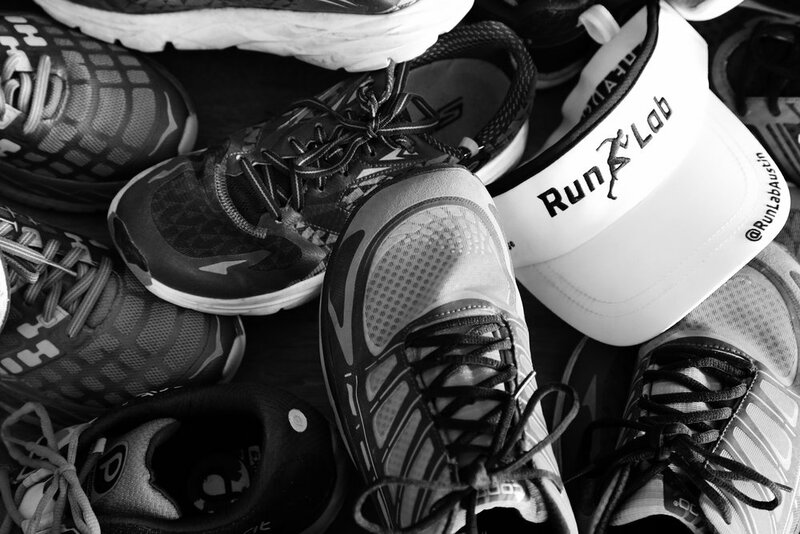 The right run shoes - shoes, as soon as you put them on should be comfortable. You shouldn’t have to break in a shoe. Nor should you feel anything that causes you even the slightest discomfort. Experiment with your rhythm and cadence - in all disciplines. In triathlon, we have the opportunity to race along with the best in the world. There is no other sport out there that gives the ‘average Joe’ a chance to push limits and sweat along the side of the Elite. Many age groupers mentally/ physical mimic a pro’s approach to the swim, bike, run... recording/splashing social media by sharing their training, nutrition, recovery tips, etc. That said, without sacrificing our type A personality that many times accompanies personal ambitious standards, goals, and commitment, I want to remind you of the simplicity and privilege it is in being an age grouper. Technically, you are not limited by the number of years that you can race in this sport. The oldest Ironman World Championship athlete has been well into their 80’s. Age group athletes don’t have to face the idea of ‘retirement’ and public announcement of leaving the sport. We have the chance of competing and staying relevant within our respected age groups/amateur rankings for really as long as we wish. This sport is no joke. Whether you are racing within yourself or striving for that podium, the sport “will beat you down”. Forget the physical strain but consider the emotional truth in that statement. Many pro athletes have come forward with an honest reality of loneliness and having a true struggle with self-worth, outside the sport. You have the chance, as an age grouper, to stay committed to a bigger picture and more fulfilling lifestyle outside the sport. Not to mention, you have the opportunity to ‘listen’ to your bodies signals. You do not have to ignore the significance of a bigger picture both mentally and physically. Your choice, “approach your training as a part-time pro (1K-2K hrs/year): while juggling a full-time job & part time friend/ family member OR spread out that 1K-2K hours over the course of 2-3 years while building and maintaining excellence in your professional and personal life)... your choice! Again, without dismissing our allegiance to our performance aspirations, we have the opportunity to better balance our lifestyle. Age groupers do not have to isolate their lives into the sport while ignoring personally, relational, profession, etc goals. It has been said over and over, “A HAPPY athlete, will be a FAST athlete”. Mind you, he owns his business, has a family of 3, and has maintained this rotation since the early ’90s! Aside from feeding the age groupers ego, you do not face the need for instantaneous success. So maintaining a balanced approach will more likely give you a happy, healthy, fulfilling, and steady growth in many aspects of your life. My hope is that you may find your formula. Have faith, your day in/day out focus and consistency will lead to new limits. Who doesn't love a fun date with your main squeeze??? Time might be limited but don't ignore the many benefits of pumping some blood for both you and your relationship. No, you don't have to 'lift the same weight'- but you can choose to do a circuit of 2-3 exercises to tackle together. Alternate who gets to pick the exercises in each circuit- you definitely will be challenged with someone else's favorites... only then to look like a champ when you throw it back on the next round. 2- Clock some sprints at the pool. Grab your goggles and plunge into some chlorine together. Warm up easy and then hit some quick intervals (consider 25's) with just enough rest to look over and wink at one another and take off again. If you are like me, you will harness your inner Nemo just to get that quick flirt in again! Jump on the trainer and knock out a quick 30 minute to 1 hour workout. Pack a punch with some 30 second efforts followed by 30 second easy spinning. There is nothing fancy here, but it is pretty 'hot' to watch your date go for it and no doubt it will be fun for the both of you. When the weather cooperates, hit the road together. I have heard couples say, 'they are faster than me' - guess what, the best riders in the world can ride with anyone, at any speed... so can you. Relax and enjoy the ride, silently work some higher cadences and/or low cadence, never overtaking your 'partner in crime' but rather just enjoying the scenery together. Trail runs are a great way to get outside together and enjoy the elements. The terrain many times demands that you take your time, don't rush and/or worry about pace. There's no hard rule to trail running- in fact, shame on you if you two don't take some time to 'hike' together and relish in natures beauty. Get outside when you can, take off the watches, and enjoy the cooler temps and something different than the pavement. Ok, so you want to get your speed work in together- keep your intervals contained (aka: a track or neighborhood block) where you can encourage, high five, or 'good game' your mate as they pass on by. No pressure who is faster, simply lapping one another will give you the umph you need to conquer your goals. IS THERE REALLY A "RIGHT" WAY TO RUN? THE MYTH: There is a "right" way and a "wrong" way to run. There are more runners hitting the trails than ever and that, unfortunately, means more injuries. Some studies estimate that upwards of 90% of runners will end up injured in any given year. Given the fact that millions upon millions of dollars have been spent on shoe design over the last 50 years, why are injury rates still the same, or even higher, than they ever were? The answer? It's not about the shoe. Consider the following recent case study from our clinic: A new mom, we'll call her Kristie, takes up running as a way to add exercise into her life. She is excited about running because it's convenient, she can run with her baby in a jogger, and it'll help her lose that added baby weight. She even thinks she might like to train for a 1/2 marathon or a triathlon at some point so she joins a social run group geared toward moms. She goes to her local running store, gets fit for shoes, is told she's a "pronator" and is put in shoes meant to control that extra movement in the foot. She starts running 3xs per week on a run/walk program and reaches 15 miles/week before she begins to have pain in her knees. She doesn't think she is "injured" per se, but figures she should get it checked out anyway and makes a visit to her general practitioner. Her doctor recommends she take a break from running until the pain is gone. She is frustrated but takes two weeks off anyway. She begins running again and within two weeks has that same pain start up. She revisits her local store, where they recommend inserts and perhaps a different shoe. She tries the inserts first and sees very little change so she returns to the shoe wall two weeks later. They help her pick something a bit more neutral, with the advice that she also use the inserts due to that pesky overpronation problem. She is excited to get back on track and starts running again with her social group, but the following week, guess what? Same knee issues. One of her running friends tells her that she read people need to run with a 180 cadence and that she should be landing on her midfoot. Kristie has no idea what that means so she does some research and starts trying to run this way. She feels like she is running in a fairly unnatural way and also quite out of breath, but the knee feels a little better! Progress?! But...wait for it, the knee pain returns two weeks in and NOW she also has calf pain. She returns to her running store, gets put in another pair of shoes and decides in frustration to just run through it if the pain returns, which it does immediately. She keeps running until things hurt enough that she decides that maybe running isn't for her. She is now hundreds of dollars and several months into running and is worse off than when she started. She does a bunch more research online and finds RunLab™. In a last ditch effort to see if we can help, she calls us. She lives in Dallas so we send her over to one of our Gait Imaging Centers™ inside of Playtri. She sets up her account online, pays, fills out her forms so our team understands her history and goals, and then sets up a time to get filmed at the Gait Imaging Center™. The Playtri staff takes care of her entire filming process and guides her through from start to finish. The patent-pending process includes both running and full-body movement pattern analysis through advanced video-capture technology, along with a full body structural, range-of-motion, and strength assessment. Once all of Kristie's videos have been uploaded and reviewed by our team, we go through her findings and send her a full-color 14 page report which breaks down everything she needs to know about the way she moves, where her strengths and limiters are, and a Footwear Prescription™. What does she learn about her running and her knee pain? She learns that onset of her pain stemmed from a structural finding (slight knock knees) combined with extreme hip weakness due to recently giving birth. She was highly unstable during the loading phase of gait and it was putting undue stress on her knees. The onset of her pain was based in didn't have anything to do with the shoe she was in. In fact, the shoes meant to control motion were actually making the issue worse because they were not allowing her foot to move through the normal pronation cycle, which moved stress up into her knees. The second and third pair of shoes were not increasing load, but they also weren't solving the underlying issue. With some gait retraining exercises and strength work specific to her structural and functional limiters, Kristie got back on track, has been running consistently for a full year and just completed her first 1/2 marathon with her daughter in a baby jogger. The take-home message? The right shoes will aid your body's ability to move naturally and as efficiently as it can in its current state, but no amount of shoe technology can solve for a weakness in the body. There is a lot of misinformation out there about running form. People are constantly coming into RunLab™ to tell us about their struggles to "fix" their heel strike, to run with higher cadence, to get their "glutes to fire", to "stop overpronating", etc, etc. But the problem lies in the fact that these runners have very little understanding of how THEIR body is built. There are thousands of variables that go into a person's ideal movement pattern. Changing the way you move isn't necessarily taking away the load, it just means you are moving it around to another area which can be more, or sometimes less, equipped to handle that load. This is where a movement analysis comes into play. It is important not only to understand the way you are built, your current range-of-motion, strengths and limiters, but also the way your body has adapted to move through them. Our brains are amazing at creating workarounds for even the slightest weakness, and when we layer compensation pattern over compensation pattern (even as non-runners) for years, there is a lot that goes into unraveling the ball of biomechanical yarn strand by strand. Creating increased range-of-motion in one area, for instance, can create stability problems, causing another area to develop compensatory hypertonicity. So what is the take-home message? If you don't understand your unique structure, range-of-motion, strengths and limiters, it is very easy to get pulled down the rabbit hole by the mountain of information from articles, under-qualified coaches, wearable technology, and your running friends who "read somewhere that you should run with your feet facing forward". Understanding your body should be the springboard to any good training plan. And remember, shoes matter, but there isn't a shoe in the world that can replace working on your biomechanics. The Garmin Forerunner 935 has been my go-to, all-in-one device for my triathletes since mid-2017 when it was initially released. Having tested other brands (and other Garmin models), while many perform similar tasks, they don't seem to do it with the all-encompassing, intuitive ease of the 935. · Lightweight - I'm not a big athlete, so bulkier devices are also a bit of a distraction for me. The 935 is so light I forget I'm wearing it sometimes, and I'll often wear it as a regular watch outside of training. · Subtle design - again, I like to wear this watch outside of training (especially if I'm keeping an eye on HR throughout the day), so I appreciate the all black, watch-like design as it can be worn with most casual or even business casual outfits. · User-friendly set up and functions - I love useful data, but technology has never been my strongest point, so user-friendly software is always a huge selling point for me. If you've used Garmins before, it will take you less than 5 minutes to figure this one out. If not, give yourself 15-20 minutes with your 935 and smart phone (you will need to download the free Garmin Connect app) prior to the first workout to set up. 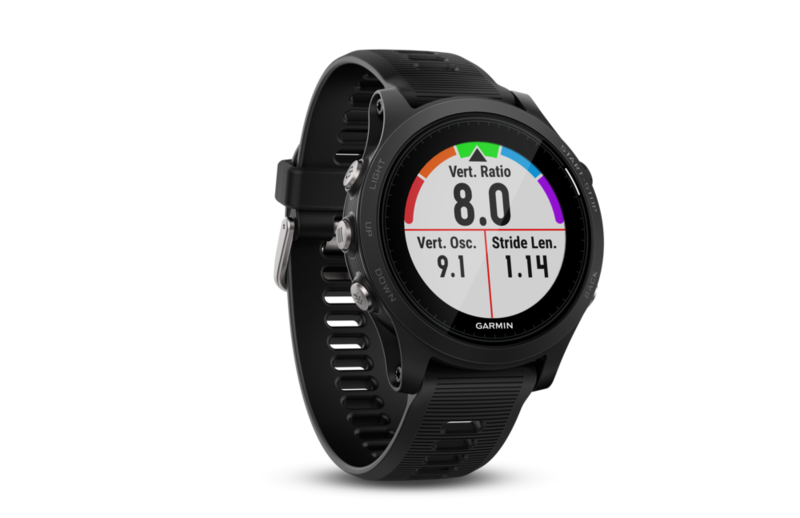 · Data screen set up - One thing Garmin has always done well is provide athletes with simple solutions for seeing the data they want to see when they want to see it, and the 935 is no exception. You can easily update available data screens for individual workout types to show the metrics you need to see in workout (the device will record all relevant metrics for a given workout type regardless of whether or not they are represented on your screen during the workout) - My go-to combo on the bike is a four screen setup showing heart rate, workout time, cadence and 3 second power. · Auto-sync with Garmin Connect (and therefore TrainingPeaks) - Myself and my athletes track all of our training and files in TrainingPeaks, and one of the key selling points for me with any Garmin is the ability to save my workout and forget about it, knowing it will load to TrainingPeaks without any additional work on my part. · Variety of functions - I coach triathletes at all levels, distances and formats, so if I can get all the metrics I need to coach from this device, you too should be covered! Heart rate, cadence, speed, power, foot turnover, stroke count and much, much more are all available in this tiny powerhouse. · Navigation - I love the nav feature so much it gets its own mention separate from the other functions. I'll sometimes lead rides with Playtri, so having back up nav is essential if we're on a new course or need to make a detour. It's also invaluable for trail running, and gravel riding if you don't already have a good bike computer. The nav works concurrently with the workout function, and is surprisingly easy to follow despite being somewhat simplistic visually (the primary difference between the nav on the 935 and the Fenix 5). The only catch with nav is that you have to load the desired route on your laptop or home computer via Garmin Connect and load it to the device prior to using it the first time. · Open water GPS - I love knowing how far my athletes (or I) ACTUALLY swam during our open water sessions and race legs! This gives me more accurate swim pace, and helps me know how much work the athlete actually did during an OWS. · Battery life - I can't explain how wonderful it is not to have to charge my training device after every workout. We've come a long way in the last 10 years! Hey - nobody's perfect! I love the 935, but there are a few things about it straight out of the box that I had to find fixes for before I was 100% satisfied with my training and racing experience. · Training status/performance updates - every so often a screen will pop up in workout telling you how the 935 thinks you're doing in relation to the baseline it has calculated for you. I don't know about you, but on a mentally tough day, I definitely don't need my watch telling me my performance is at -2 of baseline, while at the same time hiding the data screens I actually want to see. It's an easy fix, though - just go to the Settings page, then select Physiological Metrics > Performance Notifications and turn that one OFF. (Or leave it on if having your watch criticize you sounds motivating). · Text/call notifications - another feature that primarily irritated me because it would hide my selected data screens during workouts. This one is also easy to turn off via the Settings menu. · "Move" feature - this is a feature that functions outside of workout mode, and is designed with individuals more focused on general fitness in mind. Essentially, if the watch feels you haven't had enough activity that day, it will give you a little buzz and a reminder to "Move!" - however, I've had it give me this reminder 20 minutes after a 90 minute run, so you can probably guess that this was another feature I ended up turning off. Other than the above - there is very little I don't love about the 935. It's got triathletes of all levels covered, and it's the first thing I recommend to my new athletes. Staying Committed ~ It's a Mind Set! It’s early in the new year and we know that staying committed to new routines and resolutions can be challenging…especially with so many commitments to work, family, friends, etc. Day One: "My 15 minutes of the workout is better than the missed 3 miles!!!" At least I got 15 minutes in. Day Two: "I missed my run yesterday, hubs and I want to get a workout in together quickly this am, weights would feel great, what do you think and want me to do?" Day Three: "Won't get home from the office till ~2am, what can we do to make the most of my 1 hour tomorrow before I have to get back up here?" Here is an athlete with an incredible family commitment, professional career (24 hr work shifts happen weekly), and has extremely limited time. I honestly am not even talking about the details of each workout, rather the mindset that life just doesn't just stop when they are 'training for an event'. In fact, this individual signs up for IM 70.3 and IM events to compliment the crazy. What is so fun about working with this person is that they truly do realize life is all about managing the moving pieces and they actually enjoy the process - they don't try to manipulate or 'get out of the challenge' rather they go with it and MAKE THE MOST OUT OF IT! 1- Working Out & Training are NOT about perfection- guess what, just like life, we feel a sense of self-pride and accomplishment when we are committed to doing the very best we can, with whatever the day brings us- everyday. 2- It is a blast and a PRIVILEGE to have so many moving pieces to your personal puzzle- don't forget that both the process and challenges are fun. They say '80% of life is about the mind-set'... your mind set and approach are your choices: limit yourself or thrive, every single day. Make no excuses, find a way to do something, especially when it is not perfect, and have fun sticking to it. That CHILL in the air should not stop you from getting outside, and following these couple Winter Gear Tips will keep you comfortable and let enjoy some of those winter miles. Temperature, cycling speed windchill and layering. Take these three things into account when gearing up for winter riding. Just because the sun is out and it feels warm on your front porch, doesn’t mean it will be warm when riding at 18 mph into a north wind! Workload, hands and head. 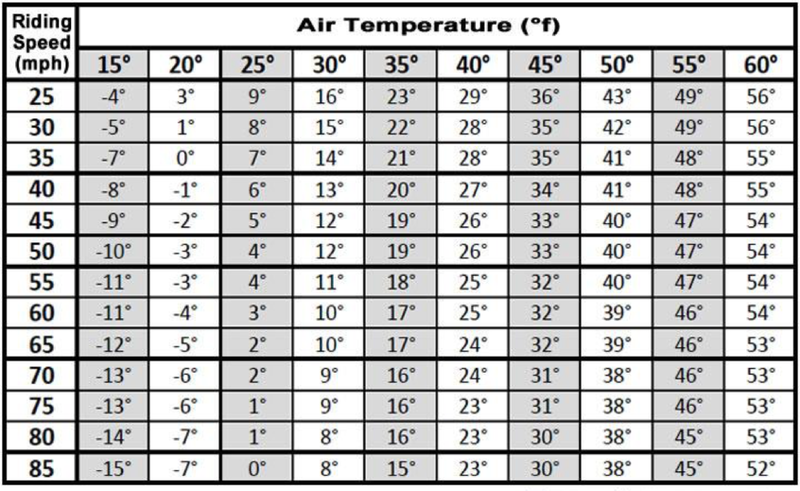 Little easier because you don’t have wind chill, but harder because you can easily overdress because your body will warm up quickly running. If you keep your head and hands covered, you can run, especially race, in any temperature. Majority of your heat is lost through your head, and your hands have the smallest amount of circulation, keeps those covered, and you are good! Running gloves ($28) winter running hats ($19) and a wind jacket ($90) will have you logging miles, even in the chilliest temps. Hope this helps you get geared up for the winter, and if it still too cold, you can always visit Playtri.com and get the ultimate indoor trainer! Shop trainers here or at your nearest Playtri Store. One of the beauties of my role with Playtri is that I get to see so many people transitioning into the sport of triathlon. Whether former athletes looking for a new challenge, people that have never taken on a physical fitness venture ever, or people somewhere in between just looking to get healthy in an entertaining and safe way, triathlon brings all walks of life together. I've always said, it's the most individualized sport with the best, all-encompassing community you'll ever find. As someone that guides people into the sport, I often get asked the most questions that ultimately pertain to how to get started - the who, what, when, where, and often why of doing triathlon. So if you're looking to get into this amazing sport, or you've already decided to jump in feet first and just need to know where to jump, here are a few key items that will help make your transition into this sport smoother and more fun! 1) Learn about the unlimited potential you have in this sport! When I first got started in the sport, I only knew about IRONMAN races. It wasn't until many months into it that I ever found out about the shorter (and more reasonable) distances that triathlon offered. Triathlon has varying distance races equating to most commonly (in distance order) the following: Super-Sprint, Sprint, Olympic, Half-Distance, and Full-Distance races. There's a race length for any and every one, and it allows you to find the challenge you want. By putting a race on the calendar, it gives you something to look forward to and stay on track in your training. The length of the triathlon season also allows for you to start advance your race lengths should you want to over the course of many months. You can safely build fitness to be properly prepared for the longer length races as your training grows through the season. If you wanted to learn to play the piano, but you'd never touched the keys before, chances are you'd hire a teacher, right? There's nothing like watching an athlete "go it alone" their first few seasons, only to drop out of the sport from nothing more than lack of knowledge. Though swimming, biking, and running are simple in theory, when you bring them all together, the combination begins to get challenging. Often we're asked "How much should I train? ", "Is XYZ enough for ABC? ", "What should my nutrition plan look like?" and so on. Every athlete is different, from physically to the amount of time they can invest weekly, so having someone help create a program that makes more sense to your needs is paramount. Whether individually, or in a group setting for the added community building of like-minded people, getting the proper direction and instruction for your triathlon training and racing will make the experience that much better for you. 4) Know the basics of triathlon gear, (and how to use it)! Triathlon is an incredible way to get fit, meet people, and create a healthier lifestyle in a fun environment. Whether a weekend warrior, or a chronic Ironman, triathlon embraces all people as athletes. Grab a family member or friend, sign up for a race, and we'll see you at the finish line!! So, my hope is like I said in Part 1 of this series, you have taken or are taking the first step in your fall/winter training schedule = recovery. ADDRESS MUSCULAR & METABOLIC IMBALANCES- IMMEDIATELY!!! You get it- imbalances are inevitable. There are so many assessments that coaches, trainers, physical therapists like to perform on clients. The goal here is not simply to get the testing done- but you should expect an easy to follow and repeatable program to build on roughly every 6 weeks. C. Added bonus: I like to educate the client on a 5-8 minute dynamic functional warm up/ movement to get the client 'going' prior to their workouts. NEXT, athletes need to readjust their daily nutrition and caloric needs! I am not talking about restricting here... but rather, you should consider pulling out the majority of the simple sugar sports nutrition and opt for real food / nutrient dense sources for energy and repair. Time to set out some time for testing, analysis, and application to the details! If you are interested in scheduling your muscular and/or metabolic testing- please contact me at Amari@playtri.com. So, maybe you just completed your first tri season, nailed your A race, and/or are already looking forward to 2019’s race season. Many triathletes get into a rut of either just laying this time of the year completely down or assume they should jump right into ‘base training’. Reality they forget and miss out on several aspects of yearly planning that will maximize their time, energy, and efforts in the “off season”. It’s been a long season (here in the south, nearly 8months of potential racing!). You have asked a lot out of your family/friends, body, mind, & yes- sometimes you even left your soul out on the course(s). With the fall/winter, the weather can be pretty rough, the days are shorter, professionally with the year ending- you might have a few projects to close up that need more attention, you have likely cut into a bit of your family/friend time, and truthfully you need some time to increase recovery mentally, muscularly, and metabolically. We always recommend athletes take a step back (notice I did not say ‘step out’) and refocus on their personal priorities and first address weaknesses outside of swim, bike, and run. * Make family / friends a priority again, weekly! There are many more factors that increase your recovery rate from the triathlon racing season- your goal, find your ways/modes that will bring back your bounce and balance. If your favorite triathlete's safety is important to you then the Garmin Varia RTL510 is a no-brainer. The current Varia functions as both a powerful taillight (daylight visibility with a 220 degree range) and as a radar device that provides visual and audio alerts to warn of vehicles approaching from behind up to 140 meters away. The device is USB rechargeable and has 15 hours of battery life in flashing mode, and 6 hours in solid mode. If your triathlete was born to roam, the Garmin 520 Plus will be the perfect companion for his or her adventures by bike. The 520 features some of Garmin's most advanced navigation options, including turn by turn directions for both on and off road courses, and Strava Live Segments with real-time results on screen. Built-in incident detection provides peace of mind for family and friends back home. The 520 will also pair with power, heart rate and cadence sensors, making it a solid option for cyclists and triathletes alike. A long-time favorite of Playtri staff and athletes alike, the 2XU line of compression socks offers both comfort and enhanced performance and recovery to athletes of all levels. Graduated compression promotes circulation through the lower limbs, while anatomical left and right foot beds provide padding and support for maximum comfort. This off-season is the perfect opportunity for your favorite athlete to try something new! Mountain biking is quickly growing in popularity among triathletes due to its ability to build sport-specific fitness and skills, while allowing athletes to explore new trails and experience different formats of the sport such as single track riding, cyclocross and gravel riding. Entry level mountain bikes stocked at your local Playtri Store typically have a lower price point than road bikes of the same quality (and all of our bikes are always priced to compete), and will come equipped with an aluminum frame and front suspension. With our 30 day no-fees exchange policy, you can never go wrong with a new bike! Does your athlete ever complain of discomfort on the bike? Have difficulty handling their bike safely? Struggle to run well off the bike in races? These are all potential signs of an athlete in need of a new fit. Many athletes may not get a "full" fit when initially purchasing their bike, and very few athletes know that their bike fit needs to be updated once a year. Make sure your athlete can ride safely and comfortably with a Playtri bike fit, which includes the initial fit and two FREE follow up sessions. Is your athlete already dreaming of next year's open water swims? Make sure he or she is prepared to swim safe with a New Wave Swim Buoy. The New Wave Swim Buoy provides increased visibility, personal storage space and a flotation device that's available whenever (and wherever) your athlete needs it. Athletes with open water anxiety will experience improved peace of mind when using the Swim Buoy, while confident swimmers can enjoy swimming with increased convenience. The New Wave Swim Buoy is one of our best-sellers! Every triathlete knows the bike needs a bit of TLC before the first race of the season, so make sure your athlete is set up for safe and fast early season riding. Our Clean Your Bike Bundle includes a Playtri Total Care Tune Up, 20 ounce bicycle degreaser and 4 ounce bicycle lube. For the athlete who wants to mix up his or her nutrition in the new year, try our nutrition sampler box. This box will come with a variety of gels, chews, waffles and drink mixes valued at $40 or more. Throw in a gift card so your athlete can purchase more of his or her favorites! We commonly have athletes ask us if carbon race wheels are "really worth it," - in one word, YES. A carbon race wheel provides a faster, more responsive ride that is also more comfortable. The current Zipp Firecrest 404 wheelset is one of our go-to wheelsets at Playtri due to its mid-range price point, all-around performer depth of 58mm, Zipp ShowStopper textured braking surface with unrivaled rim braking performance, a stiff and durable Zipp 77/177 hubset, and revised rim profile and dimpling pattern for even better and more functional aerodynamics than previous iterations. Most runners and triathletes we know will hit the roads (and trails) day or night, and in just about any conditions - if your athlete needs to get their runs in during low-light hours, make sure to equip him or her with our favorite headlamp, the Nathan Neutron Fire RX. With a 200 lumen LED spotlight for trail visibility, side strobes for increased athlete visibility, 5 lighting modes and 25+ hours of battery life all packaged in a lightweight, comfortable and weather resistant model, this head lamp will do the job for just about any athlete. So in the good ol’ USA, 2018 triathlon season is almost a wrap... days are getting shorter... temps are dropping (in much of the country, it’s starting to rain/snow cats & dogs)... LETS GET REAL, motivation at times, not so much! The tri season is long, you asked a lot out of your body- it’s time to rebuild the machine. B. Enjoy some Complimentary Sports/Activities: skiing, snowshoeing, rowing, tennis... the list goes on and on. E. Sleep: increase sleep and reduce caffeine. Listen to your natural body clock as much as possible. F: Massage/Chiro: just bc you aren’t training the body ‘as hard’ at the beginning of off season- you will start to ramp back up. You want that body ready to rumble! Keep your workouts short and sweet. No need at this point to be a slave to long hours. Throw out the idea of base work- think of first recovery (see above) and prepping the body & mind for the next phase of your yearly approach to training. You have most likely and smart I might add, been guided by pace calculation and metrics. Give them a little break and revisit listening to your body. Most coaches know to give your athletes a balance of some space to play but also schedule out some quick ‘fartleks’/ intervals to stimulate both the body and mind again. Don’t go at the fall alone. Invite some friends to head out on one of your short sweat sessions or join a local group for a couple workouts a week. Even better, plan to grab a quick bite afterward. Make a workout part of your social life. See more tips from our Playtri Coaches on the Coach’s Blog.